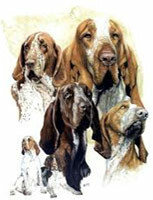 Welcome to the Bracco Italiano Society of America, Inc. The Bracco Italiano Society of America, Inc. is an organization working for American Kennel Club recognition and participation in AKC activities for the Bracco Italiano breed. The club’s goals are maintaining the integrity of the Bracco Italiano as a dual purpose versatile gun dog.